Not too long ago my wife took a trip to New York and stopped by the MoMA. When she got back she told me about a piece she saw that she knew I would love, "The Park" by Gustav Klimt. I'm not usually a fan of German Expressionism (although I do love German Expressionist films), but I absolutely love this painting. I have to go see it in person at some point. While it was painted well before anything you could call mid-century, I think a print of "The Park" would look great in a mid-century home. Especially if you have the popular mid-century interior wall color of gray. Those greens would just jump right off the wall. I have always been attracted to his work. Of course "The Kiss" was the first one that grabbed and pulled me in. I love the lush greenery and how it dominates this piece. I'm not a big fan of landscapes in general but I think he does it in a very modern beautiful way. The beech trees and poppy paintings are gorgeous too. I totally agree.... this would look wonderful in a mid-century home! I hope you get to see it some day soon. The MoMA is a real treat! 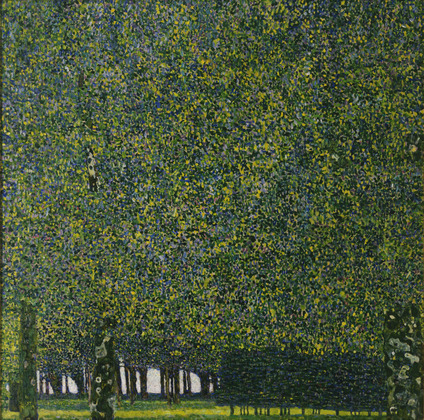 I'm generally not a fan of landscapes either, but there's just something about Klimt's landscapes. They're almost not landscapes and more a study in color and texture. All of them are outstanding. And, yeah, I think "The Kiss" is everyone's introduction to Klimt's amazing work.